For little ones under age 7, we have First Steps which introduces children to a variety of instruments and music skills to prepare them for their musical journey. Once you can play at least five notes on your instrument, you can join the fun and exciting Training Orchestra for your first taste of orchestral playing. The next stop on your musical journey is the Bridging Sounds Orchestra, a breakthrough group that fuses world music styles with classical repertoire. 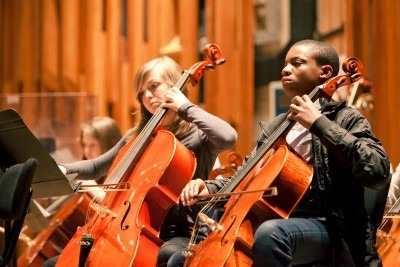 Before you know it, you’re playing with the Newham Youth Orchestra, ready to grace the stage at London’s finest concert halls. The Youth Orchestra plays classical music like Beethoven’s immense 5th Symphony, as well as Hollywood soundtracks arranged for the orchestra. To join one of our ensembles and groups, please email info@newham-music.org.uk for more information or call us on 020 3598 6260.